I wonder what the world would say if Britain blockaded over four hundred ships in the Strait of Gibraltar. There are many places that this would not be allowed and this should be one of them. Unfortunately this is the Russian way to live with their neighbours. This day, BTW, is the 79th anniversary of The Soviets attacking Finland in the Winter War. USSR provoked the attack by shelling their own soldiers in Mainila village near the border, then claiming it was Finland who shot. Ukraine's UN ambassador compared the shelling in Mainila and the Kerch-Strait incident in UN meeting couple of days ago. The Russians are emboldened since they have a puppet in the US White House. Russians, though, are not the only ones to have used casus belli. 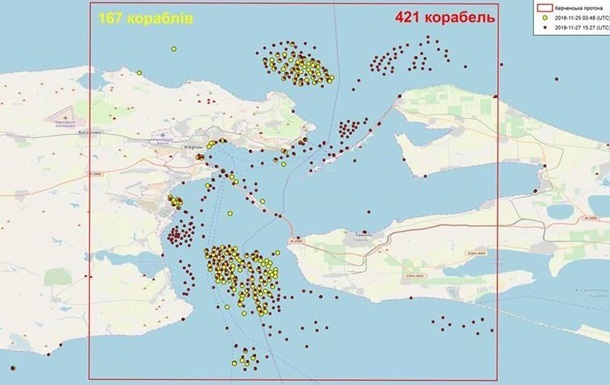 you will find that it is not only Ukrainian ships that are not allowed the passage, it is ALL ships, Russian included. Everybody is waiting on both sides (Black and Azov Seas). Probably because of weather conditions. You are correct. The US is quite familiar with this excuse. Oh, yes. The weather conditions in Kerch are terrible right now. The wind is 17 km/h, which the Beaufort scale describes as “gentle breeze” with waves up to about 1 meter high, when “leaves and small twigs are in constant motion and light flags are extended”. Who would doubt that Russia can anchor hundreds of its ships to fake bad wheather conditions.